Do you often buy stuff from the stores based on a commercial that attracted your attention? Well, my friend…you are officially a “Slave to the modern Consumerism”. There is a multi-billion dollar industry thriving on new innovative commercial and advertising on television or social media JUST to influence consumers like us. The reality is these industries are manipulating us to buy stuff we either DO NOT need or just serves us our vanity that’s all. To further enlighten our gullible consumer We at WheeBuzz have compiled these 12 shocking proof that out life is full of lies which we would NOT have otherwise believed it anyway. Those crunchy, red juicy looking carrots which all our mothers believe to be oh-so-healthy for the kids by believing the TV promo is a mistake! Yes, in fact, there is no such thing as baby carrots, because they are just regular carrots albeit smaller in size. The term “baby” is a misnomer used only as a trick. The actual history of these carrots dates back to 1980, when a Californian farmer Mike Yurosek, trimmed is ugly, stout looking carrots with an industrial shape cutter simple because his carrots were not selling! Since then these “baby carrots” increased in demand and consumption which was up by 30% in 1987 and 70% in today’s American markets. Nothing speaks of sporting’s ultimate achievement as an Olympic Gold medal. This medal not only brings the athlete to the forefront and makes him a part of the immortal hall of fame but also puts his country in the prize position as well. But did you know the “proverbial Gold medal” is not pure gold but made of 494grams of silver and just 6 grams of gold! The only time the medals were truly golden were way back in Stockholm’s Olympics in 1912! Today each pure gold medals now would cost no less than $21,200. All this while you had been pouring milk all over the table and not on the destined bowl or glass and blamed your clumsiness for it? All milk Cartons have their own secrets and the pictures down in the link shows you how to ACTUALLY pour milk without berating your milk pouring skills at all. Well… honestly, NO ONE bothers counting the actual numbers of chicken nuggets inside the sealed packets when we buy it from the frozen departments. We just take the world of the printed numbers on the packet and presume it’s true, well if you are lucky you might get 11 pieces instead of 10…who knows! Subway promises the consumers about their 30 cms sandwiches by cutting off just an inch as they are pretty sure NO ONE is going to bring a measuring tape and call out their bluff. No one notices it as well as the humongous savings they make at the end of the day. 6. Pavements are not laid manually or by Fairies! Well this technical innovation surely crushes our childhood magical notions of pavements being laid by fairies overnight, or to a bit mature observer, it’s done manually (which is quite true in the developing world still…) but in most of the developed countries, a super machine called the “Tiger Stone” usually swallows up tons of stone blocks and produces a clean sheet of paving. Well if you are left in dystopian world where there is no popcorn button on your microwave, you DO NOT need to have a panic attack or scramble for a new microwave. This is a profound life’s mystery which we unfold today. Most of the buttons are basically humidity sensors, which tells the machine when the particular food is ready and cooked. So the microwaves which do not have a popcorn button also fallow the same logic of cook time and moisture levels. So you can let out your breath again and RELAX! And you though the lids of your star bucks coffee takeout is just a fancy way to keep your security so that the coffee remains hot and piping till you reach your workstation? 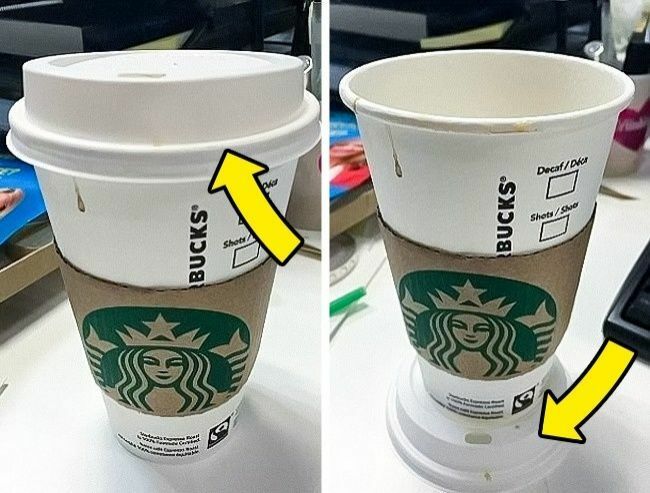 WRONG, the lids on the plastic cups are for 2 reasons, one is to close and secure the coffee from falling and burning your hands while walking, secondly it can be used as a drip mat where you can place the cup on a table or even on your hand prevent it from dripping and burning your delicate skin. The colors of our favorite gummy Bear candies have help up our imagination for decades. We loved it so did our parents and I am sure would our children too. But the colors of the gummy bear with their flavors are all mismatched! Pineapple juice is colorless but is sold as yellow, strawberry is sold as red but it’s actually a lime flavor!! So our green gummy bears are actually strawberry candy. Anyways, irresistible as they are eating too many of these goodies can give you a tummy ache and make you sprint to the bathroom on more than one occasion. The world famous beer brand Guinness, which practically has turned half of the globe as a beer lover, actually uses fish bladders for its production! Bladder supposedly filters the yeast cells and solid particles from the beer and gives that distinct aroma and taste for which males it legendary. The gelatin-like substance derived technically called the isinglass from fishes such as sturgeon is then added to the beer casks, after it has done its purification process its carefully removed, but some minuscule particles are leftover always, so BAD news for all the vegans out there, the best brand of beer is Off Limits for you guys. Now here is a TRUE shocker for all the kids and the generation of oldies that grew up reading the famous Winnie-the-Pooh stories in books or TV. Well… Winnie-the-Pooh was a GIRL! The inspiration for this classic lovable bear came to A.A Milne, the legendary creator of the character from a female bear at the London zoo, when he was visiting it with his real son Christopher Robin. Well, there is not much difference between the humans and the serpentine class of our animal kingdom as we have one big thing in common and that is we both shed skin! Yes in a lifespan, a human loses up to 77 pounds of skin which simply unbelievable!